Their closest formula to breast milk. 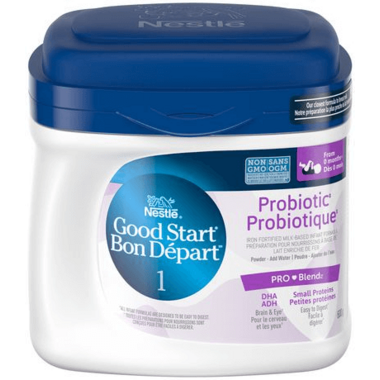 GOOD START® Probiotic with PRO-Blend Stage 1 Baby Formula (600 g) is the only non-GMO* baby formula with Probiotics. This stage 1 baby formula is designed for babies from birth (0 months) and older. GOOD START® Probiotic with PRO-Blend contains Probiotic B. lactis**, which contributes to your baby’s healthy gut flora. A healthy gut flora is part of an overall part of a healthy gut. PRO-Blend is a combination of DHA (an Omega 3 fat), which supports baby’s normal physical brain and eye development, and small proteins for small tummies. Good Start Probiotic Pro-Blend baby formula is easy to digest. Good Start Probiotic Pro-Blend is their closest formula to breast milk and the only non-GMO baby formula with Probiotics including B. lactis, a probiotic that contributes to baby's healthy gut flora. Contains DHA, an Omega 3 fat, which supports baby’s normal physical brain and eye development. Designed for your little one with small proteins for small tummies. GOOD START® Probiotic with PRO-Blend baby formula is easy to digest***. Convenient packaging with a built-in grip for one-handed use. Made without the use of BPA. Ingredients: PARTIALLY HYDROLYZED REDUCED MINERALS WHEY PROTEIN CONCENTRATE, LACTOSE, CORN MALTODEXTRIN, PALM OLEIN,SOYBEAN OIL, COCONUT OIL, HIGH OLEIC SAFFLOWER OIL OR HIGH OLEIC SUNFLOWER OIL, MORTIERELLA ALPINA OIL, CRYPTHECODINIUM COHNIIOIL**, TAURINE, L-CARNITINE, NUCLEOTIDES (CYTIDINE-5'-MONOPHOSPHATE, DISODIUM URIDINE 5’-MONOPHOSPHATE, ADENOSINE 5’-MONOPHOSPHATE, DISODIUM GUANOSINE 5’-MONOPHOSPHATE), BIFIDOBACTERIUM LACTIS (BB-12), TRYPSIN, SOY LECITHIN, ASCORBYLPALMITATE, MIXED TOCOPHEROLS, VITAMINS (VITAMIN A ACETATE, VITAMIN D3, DL-ALPHA-TOCOPHERYL ACETATE, PHYLLOQUINONE, SODIUMASCORBATE, THIAMINE MONONITRATE, RIBOFLAVIN‡, NIACINAMIDE, CALCIUM PANTOTHENATE, PYRIDOXINE HYDROCHLORIDE, BIOTIN, FOLIC ACID, VITAMIN B12, CHOLINE BITARTRATE, INOSITOL), MINERALS (CALCIUM CHLORIDE, TRICALCIUM PHOSPHATE, POTASSIUM PHOSPHATE, MAGNESIUM CHLORIDE, POTASSIUM CITRATE, SODIUM CITRATE, FERROUS SULPHATE, ZINC SULPHATE, MANGANESE SULPHATE, COPPERSULPHATE, POTASSIUM IODIDE, SODIUM SELENATE). CONTAINS MILK AND SOY. * A SOURCE OF ARACHIDONIC ACID (ARA) ** A SOURCE OF DOCOSAHEXAENOIC ACID (DHA).